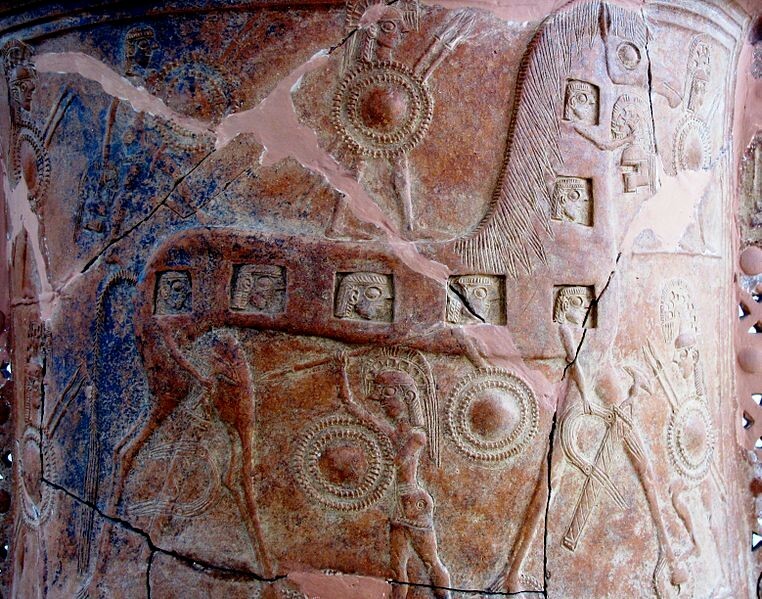 The Mykonos Vase is one of the earliest depictions of the Trojan horse (Mykonos vase). Wheels on the legs are visible, as well has holes showing men’s heads to indicate the soldiers hiding inside. The Trojan horse was used strategically in the Trojan War, which was waged between 1260 and 1240 B.C. between Troy and Greece. Our model of the Trojan horse, a large, hollow, wooden horse, provides room for about 30-40 men, has wheels, and has a door to allow soldiers to climb out of to attack. The Trojan horse comes up in many sources, in pictures, and in text. One source describes the Trojan horse as “a horse-shaped contraption of lumber” in summarizing from Homer’s words in the Illiad (Franko 122). This points out the rough design and construct of the horse, merely giving it a general shape of a horse. Our model follows this with a basic horse structure. In answer to the question of why the Trojan horse was chosen to be a horse, it made sense because “horses were of great value to Homer’s Greeks” (Held 330). It was an animal that was valuable and such a valuable offering would be graciously accepted into their enemy’s territory. This made entrance much easier. The precise number of men inside the horse is not known. “Quintus Smyrnaeus gives the names of thirty [men], but says there were more” (Wikipedia contributors). However, it is generally agreed that there were around 30-40 men inside the horse. To carry 30-40 men, it would have been large and heavy. Wheels made transportation easier. The “earliest representation is poorly preserved,” (Sparkes 55) which is the Boeotian fibula, dating back around 700 B.C. However, this creation and the Mykonos vase (another early artwork of the Trojan horse) both indicate that there were wheels attached to the feet of the horse. Our model also has a space for wheels. We included a cart for stability and made space for wheels on the cart. The legs of the horse in these two representations are relatively skinny. Our model also has thinner legs in comparison with the body. Dimensions were determined by how much room would be needed to carry 30-40 men. The Mykonos vase showed how the horse’s legs were the same height as a man, but this was not plausible for holding so many people. The Trojan horse was real and included the basic characteristics of a general horse shape on wheels with room enough for about 30-40 soldiers.